One thing is to decide to ask the students questions during classes – another is to have the ability to formulate the right questions. In the following we will offer some advice on how you as a lecturer can formulate good questions for your students. This advice is of a general nature, so if you are interested in delving deeper into the subject, feel free to contact us. Let us start with a concrete example. You are planning your next classes, which are about electromagnetism. You may have planned the content based on the course’s required reading, or on the students’ previous questions, which will have given you a sense of what needs to be revised. When the content of the lessons is more or less in place, it makes sense to consider how the students should learn the material and what they should do with their knowledge. Should they work individually or in groups, or both? Should they be able to apply and discuss the material, and what are the most important ideas and knowledge they need to take away? Considering these issues will make it easier to formulate good questions for the students. The following taxonomy is intended to help lecturers prepare relevant intellectual questions for their students. It is divided into three columns: goals, types of questions and examples. The left column describes the abilities the students need to attain to move through the various learning stages. The stages should be seen as levels that build on one another. This means that the students must be able to understand the subject before they can begin to apply it in practice. 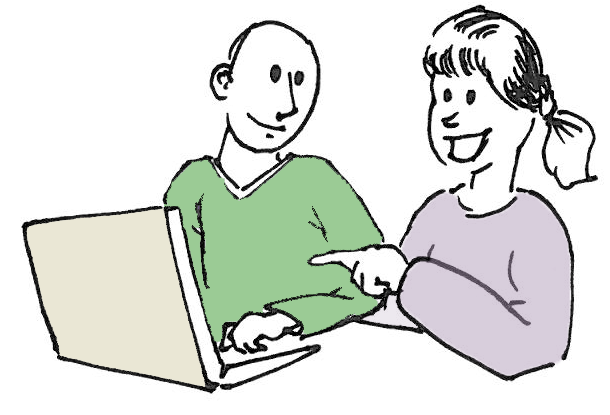 The middle column lists different types of questions that can be asked, and the right column lists examples of more specific follow-up questions. The questions can be formulated based on the intended learning goals. We have divided the taxonomy into three stages as a proposal for how the questions can be constructed in the course of the teaching. In the first stage the students can be asked whether they can remember the read material and whether they have understood it. These questions can either be asked at the beginning of the class or online before the class, which will help the students prepare for the class. (See article on student preparation.) 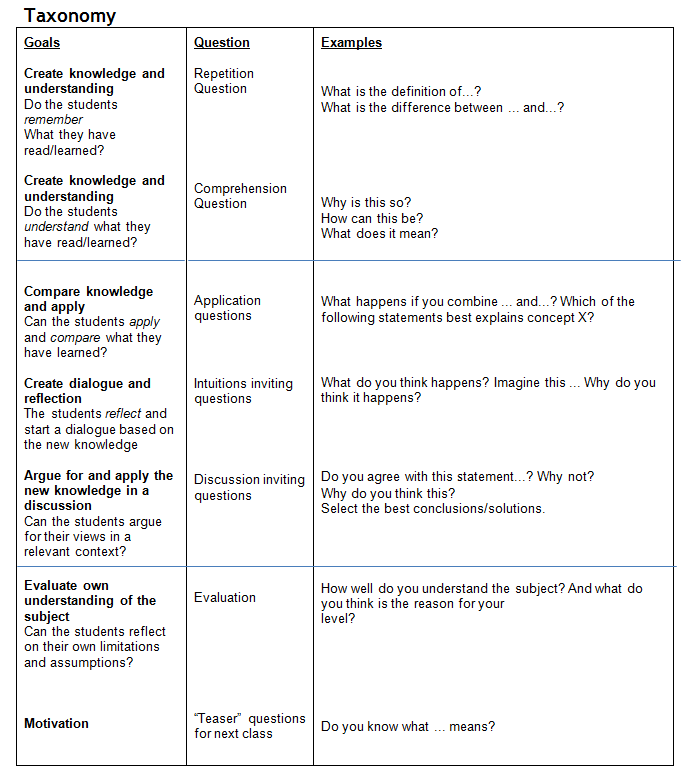 In the middle stage, the students have to apply, reflect on and discuss their knowledge. Therefore the questions should be more open and challenging. This stage can for example take place during the class using clickers. 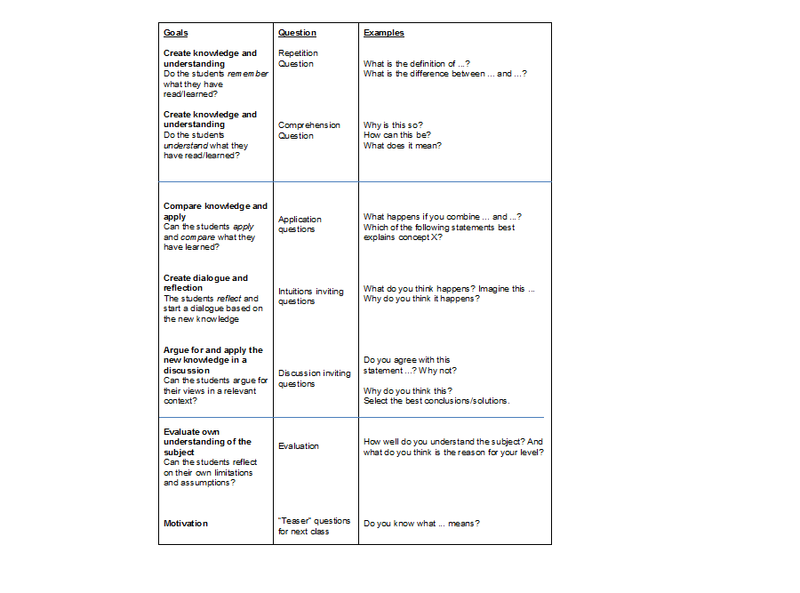 The questions in the last stage are designed to help the students evaluate their own knowledge, and can be supplemented with questions that serve as “teasers” for the next class. It may be an advantage to relate the questions to a context the students are familiar with. This makes it easier for the students to apply and discuss their knowledge. If it is appopriate for you lecture, you might use updatet news articles or public diskussions as a starting point. It may be difficult to assess whether the questions will match the students’ level. The students’ answers can be an indicator of how easy or difficult the questions should be. By paying attention to their answers you can adjust the degree of difficulty of your questions along the way. Bear in mind that some students would rather be challenged by (slightly) difficult questions than get bored by easy questions. But at the same time, questions that are too easy can be confusing, as the students may not know whether you are expecting the obvious answer or if they are trick questions. Questions put to students should be as precise as possible, without too many unknowns or assumptions of pre-existing knowledge. If the questions are too esoteric, students may find it difficult to know what exactly they are being asked to respond to. If students are able to answer “I don’t know” to the questions, it will give you a more accurate impression of ​​their response, since they are not forced to guess. If many choose “I don’t know”, it will also give you a good idea of what material you need to go through again.